“Their information has been hacked and is now in the public domain.” He said businesses should not think that would never happen to them. To give this the most charitable reading….maybe Mossack Fonseca wasn’t the best example of a hacking victim that Key might have selected. Oh true, he did also mention the hack of Sony Pictures. But that example isn’t any better. The Sony hack is widely believed to have been a North Korean operation, motivated by the Pyongyang regime’s desire for payback after Sony had financed a James Franco/Seth Rogen ‘comedy’ film about the assassination of North Korea’s political leader. In addition : among the many revelations from the Sony hack was the cold, hard evidence that the female stars on the film American Hustle ( Jennifer Lawrence, Amy Adams) were paid considerably less than their male co-stars. Subsequently, the Sony revelations have triggered a useful debate on institutionalized sexism in the US entertainment industry and corporate life in general. As noted in this great essay by Jennifer Lawrence. The Government has announced it will spend $22.2 million over the next four years on improving New Zealand’s cyber security. Of that, $2.2 million will be spent setting up a Computer Emergency Response Team (CERT). The remaining $20 million will be CERT’s operational funds. That’s the problem of course. If you portray the risks online in apocalyptic terms – yikes, the Chinese/North Koreans/Eastern Europeans etc are coming to steal our intellectual property and all of our trade secrets ! – then $5 million a year in operational funding looks like a pretty token response. Go big though, and it looks even more like corporate welfare, and state provision of protections that New Zealand business should be paying for itself. Incidentally, won’t CERT’s efforts overlap with what the GCSB is supposed to be doing in this same area ? Isn’t the GCSB supposed to be concerned with online threats to New Zealand’s economic interests? Who’s going to be the sheriff here ? Funny. Normally, our freedom-loving captains of industry fancy themselves as bold adventurers on the oceans of commerce…yet this proposal not only invites them to share their secrets with Big Brother, but to actively seek its protection. An odd fit, wouldn’t you say, ideologically speaking. Basic question : is the bulk of the online risk to New Zealand of the ‘stranger danger’ kind located offshore – or are most of this country’s online violations originating within branches of the New Zealand corporate family, as firms raid each other for market advantage ? If, as one would suspect, it really is the latter….CERT would readily become part of the problem, rather than part of the solution. How, for instance, will CERT be supposed to handle and store the confidential information that will be essential to it assisting in the provision of a significant defence? And why would any sane NZ firm think that sharing its defensive strategies with a government agency wasn’t going to pose an additional security risk in itself? In other words, everything about CERT smacks of it offering merely generic advice, and being marketing fluff for the security industry that stands to gain an influx of business from this handout of public money. Surely, if firms had genuine secrets worth keeping, then they should pay for the expertise required to keep themselves safe? Isn’t that how the free market is supposed to work? Already, the state pays for the bulk of the research and development work carried out in New Zealand, and from which the private sector reaps a good deal of private gain. Now the taxpayer is helping to pay for their online security as well; primarily, to enable the private sector to conceal information that (in some cases at least) the public needs to know. 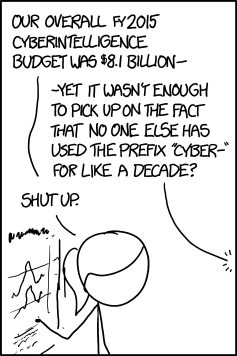 Footnote: XKCD’s Randall Munroe on the urge to ‘Cyber-‘. Corporate subsidies and protecting its interest is the actual function of the Crown NZ govt. Lots more paid online shills supporting the various corporate campaigns. “Risk managing” social media (or to use a military term cyber ” perception management”). Point taken on ethics of corporate and government cybersecurity when there is the third party of public domain and consumer protection – which is hopefully attended to more than apparent in this allocation of budget money. Firewalls; information sharing, data security and international hacking. There is nothing wrong with securing internally with the government unless the government cannot guarantee that security most especially from ‘5 eyes’ which then becomes international perceptibility and as seen is everything.